Charles Rennie Mackintosh (1868 to 1928), was a reformer of the excesses of the Art Nouveau style. The works of Rennie Mackintosh from the 1900’s give a good indication of what was to appear over the next several years. Born in Glasgow, the second son in a family of eleven children, his father was a superintendent of police. From an early age he was interested in a career as an architect. When he turned sixteen he was articled in the office of the Glasgow architect John Hutchison, while also studying as an evening student at the Glasgow School of Art. Here he came into contact with J. Herbert MacNair and the Macdonald sisters, Frances and Margaret (whom he later married), with whom he was to form the group which became known as the Glasgow Four. They exhibited together on a number of occasions; and the work shown at the 1896 Arts and Crafts Exhibition was greeted with incomprehension and distaste. In 1889, Rennie Mackintosh joined the firm of Honeyman & Keppie. He remained there until 1913, becoming a partner in 1904. His most important architectural and decorative work was done during this period. In 1896, in his capacity as an assistant at Honeyman & Keppie, he won the competition to build the new School of Art in Glasgow. From 1897 until 1906 he was occupied with designing and furnishing the chain of tea-rooms established in Glasgow by the Misses Cranston. The tea-room movement began in the 1870s to combat daytime drunkenness by providing billiard rooms, smoking rooms etc. 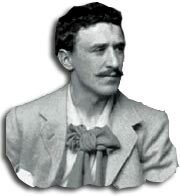 Charles Rennie Mackintosh collaborated on the Buchanan Street and Argyll Street rooms with George Walton but had complete control over the Ingram Street (1901) and Willow (1903-4) tea-rooms. The work was not completed until 1916. Charles Rennie Mackintosh exhibited, with the other members of the Glasgow ‘Four, at the Wiener Werkstatte, and found greater acceptance of his ideas in Europe than in his home town of Glasgow or in London. He had patrons in Scotland who allowed him a remarkable degree of freedom to pursue his ideas, notably the publisher, Walter Blackie, for whom he built Hill House at Helensburgh. Charles Rennie Mackintosh designed posters from the mid 1890s, and also exhibited at the 1896 Arts and Crafts exhibition. In 1897 Mackintosh began the first phase of his work on the Glasgow School of Art, which he also extended in 1907. In 1913, Mackintosh left Scotland but did very little further work. In 1920 he gave up architecture and devoted the remainder of his life to painting. Other work in Scotland included the Willow Tea Rooms (1903) and Hill House (1904). Despite international acclaim, Charles Rennie Mackintosh never achieved commercial success. He left Glasgow in 1914, and between 1915 and 1920 he carried out work for the industrialist W.J. Bassett-Lowke, most notably at 78 Derngate, Northampton. After traveling through France in the mid 1920s, Charles Rennie Mackintosh died of cancer in London in 1928.